Ten Speed Press, 9781580086653, 352pp. 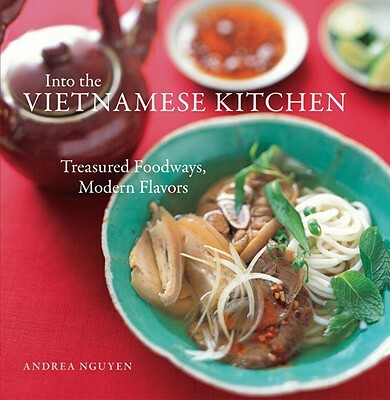 An intimate collection of more than 175 of the finest Vietnamese recipes. When author Andrea Nguyen's family was airlifted out of Saigon in 1975, one of the few belongings that her mother hurriedly packed for the journey was her small orange notebook of recipes. Thirty years later, Nguyen has written her own intimate collection of recipes, Into the Vietnamese Kitchen, an ambitious debut cookbook that chronicles the food traditions of her native country. Robustly flavored yet delicate, sophisticated yet simple, the recipes include steamy pho noodle soups infused with the aromas of fresh herbs and lime; rich clay-pot preparations of catfish, chicken, and pork; classic bánh mì sandwiches; and an array of Vietnamese charcuterie. Nguyen helps readers shop for essential ingredients, master core cooking techniques, and prepare and serve satisfying meals, whether for two on a weeknight or 12 on a weekend. Andrea Nguyen is an author, teacher and consultant based in the San Francisco Bay Area. Born in Vietnam, she came to the United States at the age of six. Andrea's food writing has appeared in the Los Angeles Times, Wall Street Journal, Saveur, and Rodale's Organic Life where she is also a contributing editor.